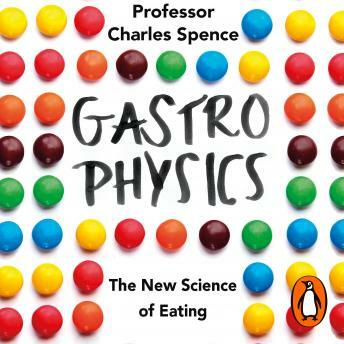 Penguin presents the unabridged, downloadable audiobook edition of Gastrophysics: The New Science of Eating by Charles Spence, read by John Sackville. These are just some of the ingredients of Gastrophysics, in which the pioneering Oxford professor Charles Spence shows how our senses link up in the most extraordinary ways, and reveals the importance of all the "off-the-plate" elements of a meal: the weight of cutlery, the colour of the plate (his lab showed that red is associated with sweetness - we perceive salty popcorn as tasting sweet when served in a red bowl), the background music and much more. Whether dining alone or at a dinner party, on a plane or in front of the TV, he reveals how to understand what we're tasting and influence what others experience. Meal-times will genuinely never be the same again.